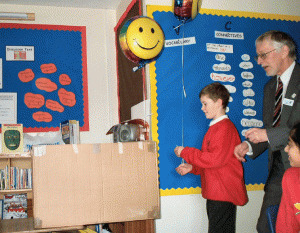 The box and balloons were the start of the Gravity Presentation for year 6 at Kingsway Junior, Watford. Ian Williamson, a SEA form Hertfordshire SETPOINT, began the talk by having the box well over the edge of the desk supported by two helium balloons ably assisted by one pupil. The ideas of how to recognise a force were covered first followed by a discussion of large and small force. CosmoLearning is promoting these materials solely for nonprofit educational purposes, and to recognize contributions made by University of Sheffield (University of Sheffield) to online education. We do not host or upload any copyrighted materials, including videos hosted on video websites like YouTube*, unless with explicit permission from the author(s). 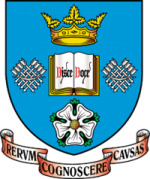 All intellectual property rights are reserved to University of Sheffield and involved parties. CosmoLearning is not endorsed by University of Sheffield, and we are not affiliated with them, unless otherwise specified. Any questions, claims or concerns regarding this content should be directed to their creator(s).